Still image from ABC News. A surfer mauled by a shark off south-western Australia managed to swim to shore despite serious injuries to both of his legs, an official and a witness said. Alejandro Travaglini, 37, was surfing at Gracetown at about 8am on Monday when he was attacked, St John Ambulance spokesman Dennis Bertoldo said. The Argentinian was treated on the beach by paramedics before he was flown by helicopter 160 miles to a hospital in Perth, Bertoldo said. The hospital described his condition as stable. Organisers said they had deployed additional shark-spotting drones and jet skis when the competition resumed to ensure competitors' safety. "If anyone is familiar with the Mick Fanning moment ... it was very similar to that, where a shark pretty much popped up and ended up knocking a surfer off his board," Jovic told Australian Broadcasting Corp radio. Lifeguards said a 13ft shark was spotted off a nearby beach two hours after the attack. 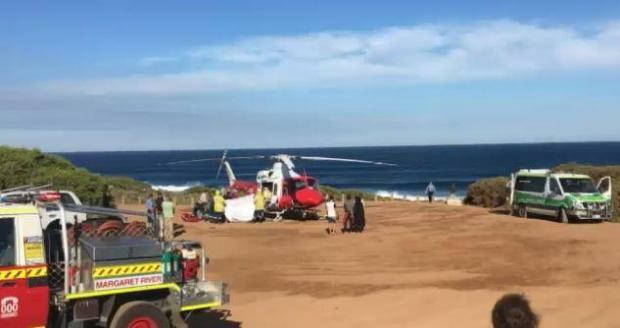 Nine Network television news reported a 41-year-old surfer sustained a large gash to his right thigh from a shark later on Monday at a beach near where the attack happened. "Happy to be alive," the unnamed man told bystanders, who asked if he was OK. The man insisted he could drive himself to a hospital.